Birthday Wishes for Niece: What can the coolest uncle or the most favorite aunt write on a greeting card for a niece? From funny quotes about the relationship that nieces share with their aunts and uncles to sweet messages about this precious bond – take ideas from this post to wish your niece a Happy Birthday. Uncles and aunts are supposed to be doting, cool and everything else that their nieces’ parents can never be. Go on, pamper and spoil your niece on her birthday. Treat her like your best friend… and not as your brother or sister’s daughter. If you can’t meet her, flood your niece’s Twitter, Facebook and Pinterest with wishes to show her how much you love her and how much she means to you. 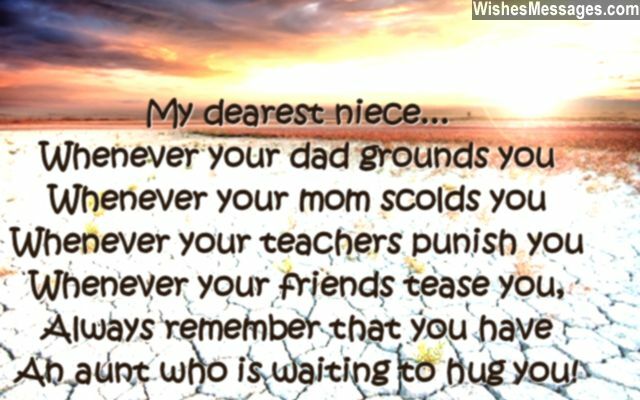 1) Whenever your dad grounds you, whenever your mom scolds you, whenever your teachers punish you, whenever your friends tease you – always remember that you have an aunt who is waiting to hug you. Happy birthday. 2) While this may sound cheesy and cliché… a niece like you makes my life complete is what my heart wants to say. Happy birthday. 3) Do you know what Google and Wikipedia have in common? None of them can explain why or how much I love my niece. Happy birthday. 4) I am officially allowed to allow you to do the things your parents have not allowed you to. Happy birthday. 5) AUNT became the coolest word in my life after you were born. Happy birthday. 6) Our relationship is not about smiles, laughs and high fives. Having an awesome niece like you makes me wanna fly. Happy birthday. 7) You are my niece, which gives you the official right to ask me for treats without feeling guilty. I am your aunt, which gives me the official right to spoil you without taking responsibility. How perfect. Happy birthday. 8) The only prerequisite for manufacturing a product called Awesome Aunt is a component called Wonderful Niece. Happy birthday. 9) I had everything in life until the day you were born… when I realized that I had nothing until the day I had a niece like you. Happy birthday. 10) I never thought that my sister would do great things in life… until she gave birth to an angel who I lovingly call my NIECE. Happy birthday. 11) I don’t care about being the best uncle in the world. All I care about is making sure that my love for my niece is the best of the best. Happy birthday. 12) An aunt-niece duo like us can give any mother-daughter pair a run for their money. Happy birthday. 13) Motherhood may be a joyous and beautiful journey, but being an aunt is way better – wild and crazy. Happy birthday. 14) I know I will never get old because I’ll relive my youth through the eyes of a wonderful niece like you. Happy birthday. 15) Ecstasy, elation, bliss and rapture are just some of the words that describe how I felt when you were born. Happy birthday to my favorite niece. 16) You may be your mother’s DAUGHTER but you are my BEST FRIEND. Happy birthday. 17) Most people make best friends in high schools. I made mine with my niece when I became an aunt. Happy birthday. 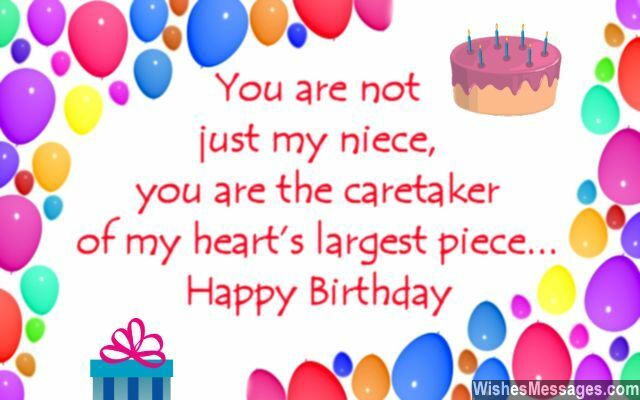 18) To my dearest niece… On your birthday your parents will tell you to work hard and be a successful woman. I will tell you to party hard and have fun. Happy birthday. 19) You are way more mature than your mom, when she was of your age. Trust me, I am her sister and I have seen her throw crazy tantrums. Happy birthday, my dear niece. 20) I wanted a beautiful niece and your parents wanted a beautiful daughter… you made both our wishes come true. Happy birthday. 21) We may be related by blood and family, but the truth is that we are more like besties. Happy birthday. 22) May our aunt-niece relationship always make your mom jealous. Happy birthday. 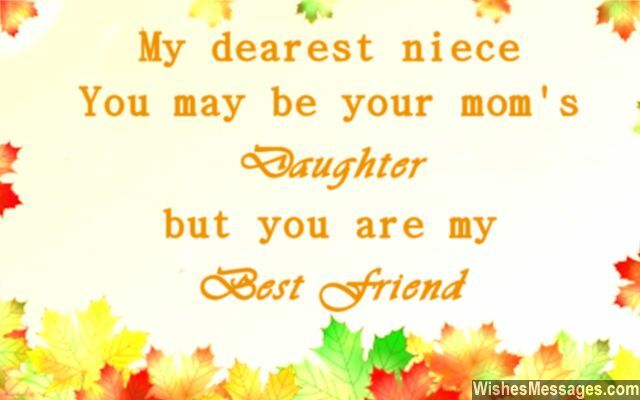 23) My niece… you are the only one who I can treat as a daughter and also have as a best friend. Happy birthday. 24) You are my NIECE – Naughty, Impatient, Energetic, Cute and Expressive. I love you, happy birthday. 25) When you called me Uncle for the first time, I felt old. But as you continued calling me Uncle again and again in your cute voice, I felt like the luckiest uncle alive. Happy birthday to my adorable niece. 26) I have a pacemaker in my heart called NIECE – your cuteness has full control over my heartbeats. Happy birthday. 27) To my dearest niece… the best piece of advice your aunt can give you on your birthday is – Be Yourself, because you are perfect. Happy birthday. 28) Dearest niece… to relieve stress, some people meditate while others do yoga. I just look at your cute pictures. Happy birthday. 29) The official definition of Niece in Merriam-Webster is – a daughter of one’s brother, sister, brother-in-law, or sister-in-law. But my personal definition of Niece is – a lovely young girl who is my second daughter. Happy birthday. 30) Pursue your dreams and give life your best shot. Never be afraid to fail, because your uncle’s always got your back. Happy birthday. 31) You are not just my niece… you are the caretaker of my heart’s largest piece. Happy birthday. 32) You are my sister’s daughter but we can all see where you got your looks from – your beautiful aunt. Happy birthday. 33) As you surf through your teens, I wish that you ride the waves of SUCCESS on a surfboard called HAPPINESS. Happy birthday to my beautiful niece. 34) Becoming a father to such a talented, intelligent and pretty girl like you – this is my brother’s biggest accomplishment in life. Happy birthday to my niece. 35) My dearest niece… If you were a jewel, you’d be the most radiant and precious in the whole universe. Happy birthday. 36) Cool, awesome, fun and beautiful – you are my only relative who has all these qualities. Happy birthday to my pretty niece. 37) The most precious gem in the world is not a sapphire, emerald, ruby or a diamond. It is you, my niece. Happy birthday. 38) Lack of responsibility is the best part about our uncle-niece relationship. You can irresponsibly ask your uncle to give you treats and I can irresponsibly spoil my niece with expensive treats. Happy birthday. 39) If I had to turn back time and relive my youth – it would be a personification of YOU. Happy birthday. 40) Just the thought of how adorable a niece that you are, keeps me warm even though, from each other we are far. Happy birthday.